The American black bear is a large warm blooded mammal that inhabits the forested areas of North America including 32 states, northern Mexico, and Canada. It is found in almost all the same areas where there has been reports of bigfoot. Adult male black bears can weigh around 350 pounds while females can weigh around 200 pounds. There are some reports of black bears weighing 800 pounds or more and some standing 6 feet to 10 feet tall when standing or walking upright. The life span of an American black bear is normally around 30 years or more in the wild. 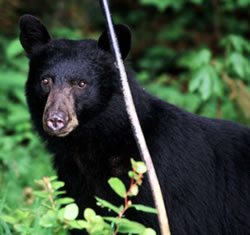 Black bears are excellent climbers and in the south may actually den in large trees. Black bears can run in excess of 35 mph for short distances, they have good eyesight and they see in full color, they have great hearing, and an exceptional sense of smell, they are great problem solvers, and are very adept at avoiding human contact. Black Bear in a Tree Den with a young Cub. Black bears are omnivorous which means they eat both meat and plant matter and will eat insects as well, they are opportunistic and will take advantage of any easy meal. There primary diet in the spring time consist of herbs and forbes primarily, but they will eat some small animals as well. Summer time diet includes soft mast such fruits which include black berries,muscadines, and mushrooms,polk berries and hack berries. 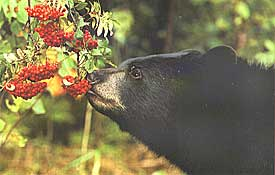 Black Bear eating some berries. In the fall diet switches to hardwood mast such as acorns,walnuts,hickory nuts, and pecans as well as small animals and roots. 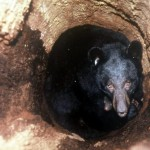 Black bears will also search in trash cans looking for a easy snack. 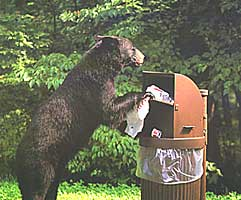 There has been many reports of bears and bigfoot searching through dumpsters and trash cans looking for a meal, as well. Most black bears hibernate in the winter with the exception of the Louisiana black bear which semi hibernates or may not hibernate at all. Some of this deep sleep or lack of it, may be linked to weather conditions and temperatures. Black bear populations range around 150,000 in the pacific north west, 200,000 in Alaska, 80,000 in the north, 65,000 in the north east, 20,000 in the south. So if an area can sustain a large population of black bears, then it is feasible that a small population of sasquatch could also call it home. It would also be safe to assume that black bears and bigfoot would eat many of the same types of food and possibly do the same type of activities. One would think that if a black bear is smart enough to find a shallow stream with fish in it and proceed to catch and eat fish, that a bigfoot, which is thought to be more intelligent that bears, could also do the same thing. So if you're looking for bigfoot, you might want to know the bear population of the area before heading out. *Keep a clean camp. Put garbage in wildlife-resistant trash containers. *Store food in double plastic bags and, when possible, place the bags in your vehicle's trunk or in wildlife-resistant food lockers. Double-wrapped food may also be placed in a backpack or other container and hang it from a tree branch at least 10 feet above the ground and 4 feet out from the tree trunk. Never store food in your tent. *When camping, sleep at least 50 to 100 yards from your cooking area and food storage site. * Hike in small groups and make your presence known by singing or talking. *Keep small children close and on trails. *Stay calm and avoid direct eye contact, which could elicit a charge. Try to stay upwind and identify yourself as a human by standing up, talking and waving your hands above your head. *Do not approach the bear, particularly if cubs are present. Give the bear plenty of room. *If you cannot safely move away from the bear, and the animal does not flee, try to scare it away by clapping your hands or yelling. *If the bear attacks, fight back aggressively. As a last resort, should the attack continue, protect yourself by curling into a ball or lying on the ground on your stomach and playing dead. Thanks Shawn. Also for the record this does not mean if there is no bears in an area that there is no bigfoot. 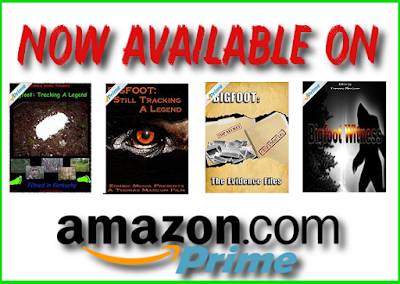 This article is just to show that large animals can and do live our woods and that bigfoot can do it as well.